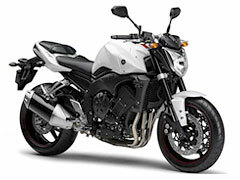 1000cc sport models inheriting the high-spec YZF-R1 engine Yamaha "FZ1" and "FZ1 FAZER" Debuting on the Japanese market | Yamaha Motor Co., Ltd.
On February 28, 2008, Yamaha Motor Co., Ltd. will release on the Japanese market the new sports model "FZ1" (without cowling) and its tourer variation model "FZ1 FAZER" with a semi-cowl and a number of touring features. Both of these models mount a lightweight, compact high-performance 1000cc, liquid-cooled, 4-stroke DOHC, in-line-4, 5-valve engine inherited from Yamaha's proud supersport flagship, the YZF-R1 (2004 European model spec). Based on the popular European models FZ1 and FZ1 FAZER, these new models have been developed to fit the needs of the Japanese riding environment under the key words "Emotional Urban Sport FZ1" and "Emotional Touring Sport FZ1 FAZER" with the aim of providing a new-generation big bike with a high-performance engine that lets riders enjoy both exhilarating around-town riding and touring in the countryside. Since its 2006 debut in Europe, the FZ1 and the semi-cowled FZ1 FAZER have been popular for their combination of supersport performance and enjoyable ride that is efficient and comfortable for around-town riding and other uses. In light of changes in the traffic environment, such as changes in the speed limits on expressways in countries like the UK, France and Germany, these models have been particularly popular among riders who, unlike supersport fans, want an even more enjoyable ride in the practical-use speed range. Meanwhile, in the Japanese market, demand for sports bikes (over 250cc) stands at about 180,000 units annually. Within this demand, the number of "big bikes" in the 401cc and over class are selling in increasing numbers due to factors like the relaxation of traffic regulations, such as the 2005 removal of the ban on tandem riding on expressways. These changes have been accompanied by a rapid diversification of user needs, including a call for high performance that can be enjoyed even in practical everyday use. In light of these market trends, these new models have taken the proven European market models as a base and developed them to fit the needs of the Japanese riding environment under the key words "Emotional Urban Sport FZ1" and "Emotional Touring Sport FZ1 FAZER." These are models that offer high-performance that can be enjoyed from the practical-use speed range on up. The power unit is a liquid-cooled, 4-stroke in-line-4, 5-valve engine based on the 2004 export model YZF-R1 engine. The lightweight, compact design of this power unit is also one that contributes to better overall concentration of machine mass. It has been developed on this model to provide emotional performance and good drivability, while maintaining the high performance specs of the original R1 engine. By changing the compression ratio (12.3:1→10.5:1), optimizing the cam profile and increasing the inertial mass of the crankshaft by 40 percent it achieves both good power on secondary roads and practical-use speed range and excellent drivability. In order to achieve both good drivability and environment-friendly performance, a fuel injection (FI) system with sub-throttle valve is adopted. In addition to main throttle valve actuation, sub-throttle valve (*) actuation is performed by motor drive that reflects information about rpm and degree of throttle opening via the ECU. This control system optimizes the intake air speed and realizes best volumetric efficiency in all rpm ranges and helps achieve excellent drivability in the low- and mid-speed ranges. Also, to accommodate the changes in the engine spec, the control unit mapping has been optimized to provide very linear response in the practical-use speed range. (*) Sub-throttle valve: This is an auxiliary valve that functions to optimize the speed of the intake airflow to supplement the function of the throttle valve that regulates intake air volume. The inertial mass of the crankshaft has been increased by approximately 40% compared to that of the YZF-R1 in order to optimize the balance between engine displacement and the inertial mass of the crankshaft. In addition, the combined effect of optimized intake system and fuel injection settings and gear ratios and a new cam profile, help give these models a truly exciting feeling of acceleration and great drivability at the same time. A chamber-less exhaust pipe that reduces unit weight and a hexagonal-design short-type silencer have been adopted. Also, a catalytic converter is built into the exhaust pipe to help clean the exhaust and lower emissions. An all aluminum metallic-mold cast frame has been adopted. This is a frame type that offers a high rigidity in relation to frame weight and enables excellent rigidity balance. To optimize rigidity balance in each of the vertical and horizontal directions and with regard to torsional force, the thickness of the part in the pivot assembly and in the head pipe assembly are varied in a stepped manner with millimeter precision. This optimized balance contributes to a high level of sporty handling. As with the YZF-R1, the engine mounting system utilizes the engine as a stressed member of the frame. And, as with the YZF-R1 and the MotoGP racer YZR-M1, it is a mounting system that basically "hangs" the engine within the frame in a way that increases rigidity and thus contributes to better machine handling. It is also a factor that contributes to a greater feeling of stability during braking. To achieve both excellent rigidity balance and an attractive external look of quality, a die-cast rear arm made by the Yamaha-exclusive CF aluminum die casting method has been adopted. The front suspension adopts an upside-down fork with the same 43mm size tubes as the YZF-R1 that achieves by both good cushioning and quick handling characteristics. For the FZ1 and FZ1 FAZER, a unique system is adopted that enables separate left-side damping force and right-side rebound force generation. On this system, which has been proven effective on the YZR-M1 MotoGP racer, the direction of oil flow for damping force generation is always the same, which makes for simplified setting. To accommodate the high power and performance of these models, a brake system with a high level of stopping power and controllability has been adopted. The same size φ320mm front disk brake as the YZF-R1 is adopted along with a single-piece caliper that reduces caliper distortion when braking force is applied. The result is greater stability and controllability during hard braking. The rear brake has a φ245mm size disc in combination with a single-pot pin slide type caliper for excellent braking power and controllability. The meter panel adopted on these models has a digital-display speedometer on the left and an analog tachometer on the right and a design that reflects the look of concentrated mass that defines the machine's overall design image. The meter panel's illumination is a fade-in type that brightens gradually when the key is turned on to let you enjoy a moment of "rider-machine communication" as the engine starts up. It is also back-lighted type illumination with a brightness adjustment function. Other features include 1) the same lightweight 5-spoke wheels as the YZF-R1 front and rear and 2) an ideal weight distribution of 50.2% on the front wheel. In addition to the basic features shared with the FZ1, the FZ1 FAZER also features 1) a semi-cowl with excellent rider wind protection qualities and 2) a special seat designed for greater comfort in tandem riding and a special grab-bar to provide good functionality in touring use. Also, the exterior color of the engine is black for the FZ1 and silver for the FZ1 FAZER to accentuate the unique character of each model. 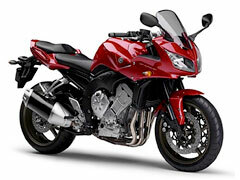 Yamaha "FZ1" and "FZ1 FAZER" Specifications [ ] indicates "FZ1 FAZER"